Exel Rubber Noridic Walking Tips/asphalt Paws Fit Exel, Swix and Leki Walking and Trekking Poles. These Are NOT Cheap Rubber Tips From China! Original EXEL Nordic Walking Rubber Tips/Asphalt Paws. NOT Cheap rubber tips from China! The American Nordic Walking System and SKIWALKING.COM are the only source in North America for EXEL Poles and EXEL Nordic Walking Tips/Asphalt Paws. Ideal for Nordic Walking on pavement and other hard surfaces – including leave no trace hiking on rocks. The original EXEL Nordic Walking Tips/Asphalt Paws! Ideal for Nordic Walking on pavement and other hard surfaces – including leave no trace hiking on rocks. Longer lasting than the cheap rubber tips coming in from China. The American Nordic Walking System and SKIWALKING.COM are the only source in North America for EXEL Poles and EXEL Nordic Walking Tips/Asphalt Paws. .95 per pair. Fit most EXEL, LEKI and SWIX Nordic Walking and trekking poles. suprememastertv.com – HEALTHY LIVING Dr. T. Colin Campbell’s The China Study: Reducing Risk of Disease through a Vegan Diet-Part 1 . Episode: 872, Air Date: 2 – Feb – 2008. NEWS: Eating Paleo Diet with Meat now linked to DNA Damage & Cancer. Harmful compounds raise risk of bowel disease · Volunteers fed diet heavy in beef and pork. DNA damage and cancer resulted from eating red meat. "Eating large quantities of red meat can increase your risk of bowel cancer by producing substances in the gut that damage DNA, a study reveals today." A comparison of cells from the lining of the colon shows that people who eat a diet high in high red meat have a "significant" increase in levels of DNA damage compared with vegetarians. This damage can increase the risk of developing cancer, say researchers at the Medical Research Council’s (MRC) Dunn human nutrition unit in Cambridge. The finding follows a major European study last year which indicated that people who eat two portions of red or processed meat a day increase their risk of bowel cancer by 35% compared with those who eat one portion weekly. The research by the MRC, monitored the diets of nearly half a million men and women in 10 countries over five years. The new study, led by Sheila Bingham and published today in the journal Cancer Research, looked for physiological changes that could explain this result. "The question was: what was the reason for this association?" she said. "With this research, we have established a direct link." The scientists monitored 21 volunteers, who each undertook three 15-day diets. The first, high-meat, diet featured roast beef sandwiches, minced beef pie, sweet and sour pork and cottage pie; the second, vegetarian, cheese or egg sandwiches, vegetarian and pasta bake, egg and chips, and lentil bake; and the third, meat dishes but higher levels of fibre. Cells from every stool sample were then analysed to check for the presence of any alteration in DNA. The researchers found that when the red meat diet was compared with the vegetarian diet, there was a "consistent and significant" increase in DNA damage, while damage was intermediate with the red meat/high fibre diet. The damage was specific to substances called N-nitrosocompounds (NOC) found in increased levels in the large bowel of red meat eaters. Some of these compounds are thought to combine with DNA and destabilise it, making it more likely to undergo harmful changes that increase the risk of cancer. Fibre may reduce the risk because it gets rid of damaged cells. Scientists welcomed the findings as 80% of bowel cancer is thought to be related to diet and therefore largely preventable. Each year 35,000 people in Britain are diagnosed with bowel cancer, and 16,000 of them die. David Shuker, of the Open University, who had previously established a link between NOC derivatives in meat and DNA changes, said: "These combined discoveries have allowed us to link red meat consumption to an increased risk of bowel cancer and may give us some clues about developing a screening test for very early changes related to the disease." Colin Blakemore, the MRC’s chief executive, said: "Large bowel cancer is the second most common cancer in western countries and nearly 1m cases occur each year worldwide. This latest study, together with the compelling epidemiological evidence published last year, is an important step towards understanding and potentially preventing this common disease." Ed Yong, of Cancer Research UK, said the study emphasised the need for a healthy, balanced diet with plenty of fibre, fruit and vegetables and reduced levels of red and processed meat. But the Meat and Livestock Commission pointed out that the research assessed people eating 420g (15oz) of red meat a day – over five times more than the average man’s quota of 80g (3oz), and over eight times the average woman’s intake of 50g. An average fillet steak weighs 140g and an average burger about 100g. "The danger is that people will take the message from this that red meat is unsafe," said the commission’s spokesman, Guy Attenborough. "But they’re talking about giving people the equivalent of two 8oz steaks a day, seven days a week. Anyone whose diet is that unbalanced is going to have problems." Men who eat beef may end up in male cancer of the rear-end. This is now confirmed by medical science. If you feed your child hot dogs, hamburgers, steaks, sausage, and what you thought was a healthy diet, you are actually causing potential DNA damage to your own child every time you feed your child meat. 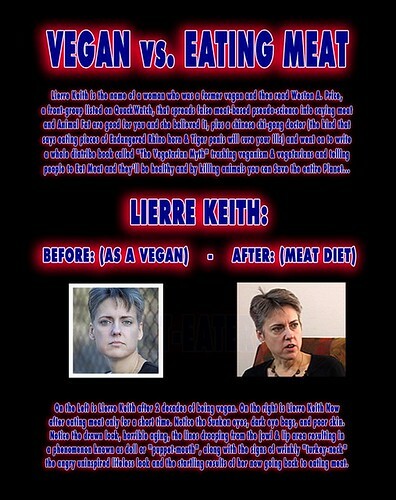 "Lierre Kieth", "Lierre Keith", "lierrekeith.com", "The Vegetarian Myth", "Failed Paleo Diet", "amazon", "book", "audiobook", "bound together", "BT books", "Blood and Soil", "Michael Pollan", "author", "writer", "radical", "Feminist", "environmentalist", "locavore", "deep green resistance", "pied", "pie face", "PM Press", "B0034PPEQ8", "food", "aric mcbay", " ISBN", "978-1604860801", "justice", "sustainability", "paleo diet failed", "vegan diet fails", "failed vegan diet", "vegan diet failure", "failure of vegan diet", "failure of paleo diet", "reformed vegan", "reformed vegetarian", "reformed paleo", "crossfit failed", "crossfit failure", "failure of crossfit", "vegan diet deficiencies", "vegetarian diet deficiencies", "paleo diet deficiencies", "paleo lose weight", "Case against veganism", "Robb Wolf", "Primal Blueprint", "Mark Sisson", "Marks Daily Apple", "MarksDailyApple", "PaleoHacks", "Paleo Hacks", "Switched to Paleo", "Switched from Paleo", "Switched to vegan", "Switched from vegan", "Changed from paleo", "Changed from vegan", "former paleo", "former vegan", "former vegetarian", "new to paleo", "feel better", "felt better", "grassfed beef", "Grass-fed beef", "lean meats", "grains", "low carb", "low carber", "soy estrogen", "vegan b12", "Vegan b-12", "Vegan vitamin b-12", "Vitamin B-12 in vegan diet", "Art Devany", "Richard Nikoley", "Freetheanimal", "Barry Groves", "Paul Jaminet", "Dr Robert Mercola", "Dave Asprey", "BulletProof Exec", "hypocrites", "deaths", "soy infant formula", "westonaprice.org", "wise traditions", "weston price", "inuit cancer", "maasai diet", "bacon cancer", "red meat", "fat head", "china study", "Denise Minger", LFRV, "Raw food sos"
For thousands of years, medicine men and shaman from many cultures have recognized the value of green tea in maintaining health. 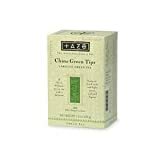 China Green Tips, like all Tazo green teas, is prepared in a way that maintains the natural health benefits, color and taste. The tea is steamed to neutralize the oxidating enzyme, then dried using a panfired technique to bring out the maximum flavor. Like black teas, China Green Tips and other Tazo green teas are made from the same botanical species, Cameila Sinensis and can contain as much caffeine as black teas. China and France signed major industrial deals worth more than $ 20 billion Thursday at the start of a lavish state visit by Chinese President Hu Jintao and a high-level government and business tourage. Before you let the cost of food, entertainment and travel cut too deeply into your budget, consider these expert tips to get more holiday for your money. I just want to send my condolences to the Tennessee Titans. Good luck with the whole Randy Moss situation. Based on Moss’ history in the NFL, I have a hunch that picking him up might not work out well for the Titans.